A week ago fellow bloggueur Gary pinged me and asked me if I had any interest in joining a dinner that was being organized at a private dining room. Well, I was completely plastered when he pinged me on a Sunday afternoon, and it took me until well after dinner time to sober up, check out his pics from the last dinner, and respond. At the appointed time, I leisurely strolled out of my office building, traversed the 10 meters to the other side of the street, and found myself in front of a building that, in my 2 years of working out of my current office, I had never once taken notice. Dinner would be here tonight, at a private entertainment facility in the heart of Central. Although I had never had the pleasure of meeting the organizer before, I found myself among familiar faces. We had chefs, restauranteurs, and the venerable Dashijie (大師姐) - eldest pupil of the late Pearl Kong Chen (江獻珠). I had the pleasure of dining with Dashijie once last year, and tonight we were also joined by Mrs. Chen's godson Wilson. As I looked around the table, it was very obvious that the person with the least knowledge about Cantonese cuisine - or food in general - was yours truly. Pan-fried termite mushroom (煎雞盅) - one of the guests supplies wild mushrooms from Yunnan, so we started with twin plates of shrooms. This was very nice. Pan-fried without any oil whatsoever, since the mushrooms themselves have enough oil and moisture. Pan-fried matsutake (煎松茸) - I gotta admit that I'm a Neanderthal when it comes to matsutake mushrooms... I haven't had them all that many times - probably because my first experience left me wildly disappointed - and most have probably been dried slices which were rehydrated. Tonight, finally, a lightbulb went off in my head and I finally realized what all the fuss was about. The fragrance wasn't the intense, in-your-face type, but more subtle and elegant - with a long finish. Very, very nice. Barbecued Iberico pork (黑毛豬叉燒) - I'm assuming this is Iberico and not Japanese kurobuta (黒豚). This was kinda different... There was definitely strips of fat, but in general this was leaner than expected. Plenty of strong pork flavors here, and this was also interesting in that it was done with soy sauce in lieu of the usual honey glaze. Yum. Pan-fried medallions with birds' nest (琵琶燕窩餅) - not surprisingly I couldn't really taste the birds' nest, but the crab meat was very tasty. Spongy, tofu-like texture thanks to egg whites made these pretty easy to inhale. Very yum. Crystal king prawn (玻璃大蝦球) - I've stopped ordering this at various restaurants around town, because so many kitchens add way too much baking soda to achieve the texture they desire, and some also add a layer of corn starch glaze. Stir-fried tripe with mixed vegetables (七彩炒肚尖) - this classic mix of pork tripe, celery, red bell peppers, water chestnuts, yellowed chives, sweet pickles, coriander and Indian almonds was one of the best I've had in town. In fact it could very well be better than the one at Tim's Kitchen (桃花源), thanks to the chef's skills stir-frying this at high heat for that wok hei. Double-boiled winter melon soup with shrimps, Yunnan ham, fresh crab meat and lotus seeds (百寶燉冬瓜盅) - one of the better versions I've had in memory. Yes, I think I even prefer this to the one I normally get at Fook Lam Moon (福臨門). Even though both versions feature the same ingredients - crab meat, shrimp, whelk, roast duck, ridged gourd, lotus seeds and Tonkin jasmin (夜香花) - I found this to be more to my liking. The reason? The flavors of the soup was much milder. The chef did use Yunnan ham to create the base, but one could hardly taste it. Steamed blackspot tuskfish (清蒸海青衣) - really, really wonderful. The flesh was so fluffy and pillowy... but just firm enough. Four treasure vegetables with Yunnan ham (雲腿扒四寶蔬) - not bad, but our resident Yunnan expert felt the ham could have been of better quality. Sautéed rice rolls with minced beef, bean sprouts in satay sauce (沙爹牛肉炒腸粉) - OMG this was sooooo freakin' good! Why did I only get half of a small bowl?! Why is it that you only get to eat something like this at the very end of a huge meal, when you're already totally stuffed... when you have very limited stomach space left?! Since my office is literally right next door, can the chef just whip up a big bowl of this for me at lunchtime? I would have no problems eating this 3 times a week. Almond cream with egg white and lotus seeds (蓮子蛋白杏仁茶) - nice and creamy, with just enough almond fragrance. Isojiman Daiginjo Junmai (磯自慢 大吟醸純米), BY25 - very fragrant nose of banana, honeydew melon, starchy rice. 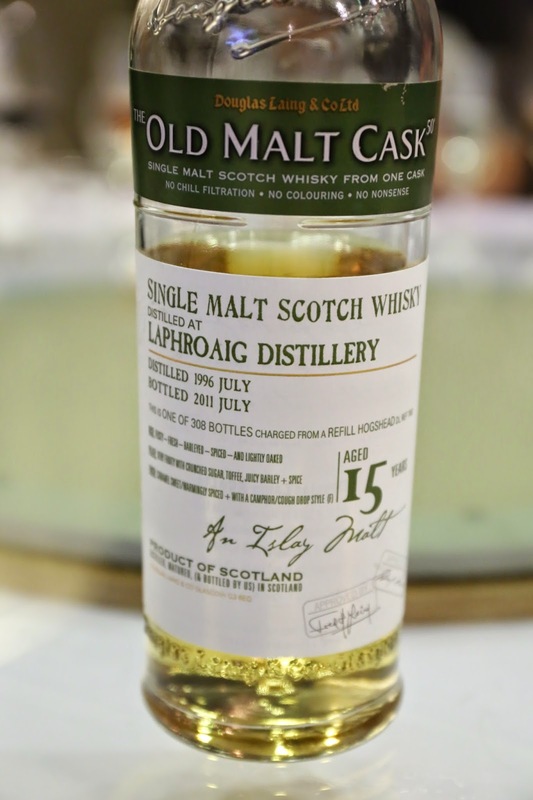 Medium palate between sweet and dry, with a dry and spicy finish. 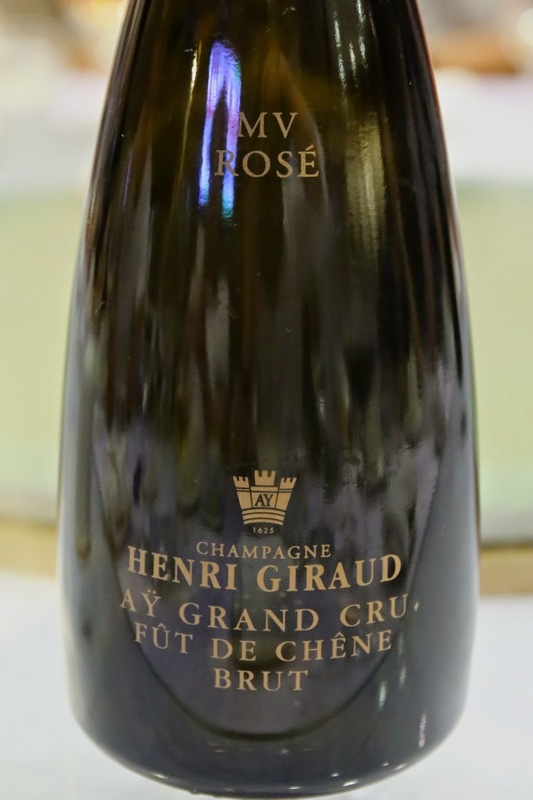 Henri Giraud Fût de Chêne MV Rosé - pretty fruity and yeasty on the nose. Kinda ripe on the palate with some bitterness on the finish. Egly-Ouriet Brut Tradition Grand Cru, dégorgée Septembre 2008 - ripe and caramelized on the nose, with savory minerals and salty plum (話梅). Also ripe on the palate. It's been 6 years since disgorgement so this is showing a little age. 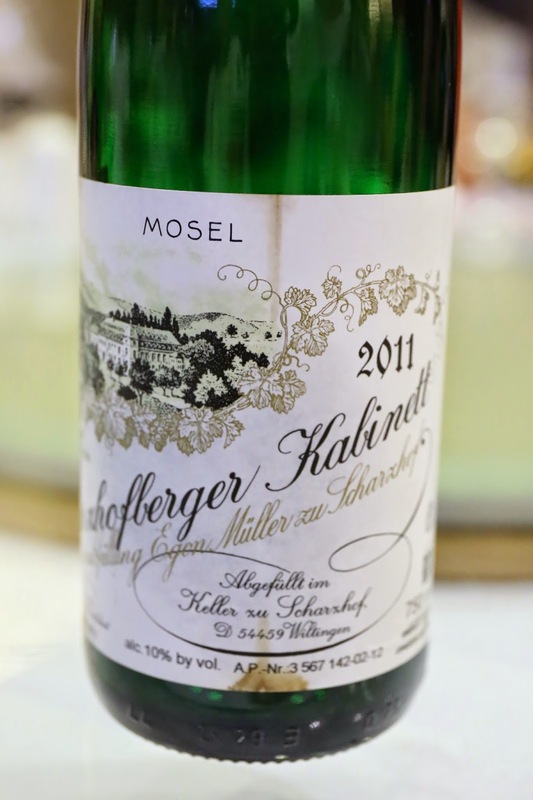 2011 Egon Müller Riesling Scharzhofberger Kabinett - lovely, floral nose with flinty notes. Palate was surprisingly sweet for a kabinett. 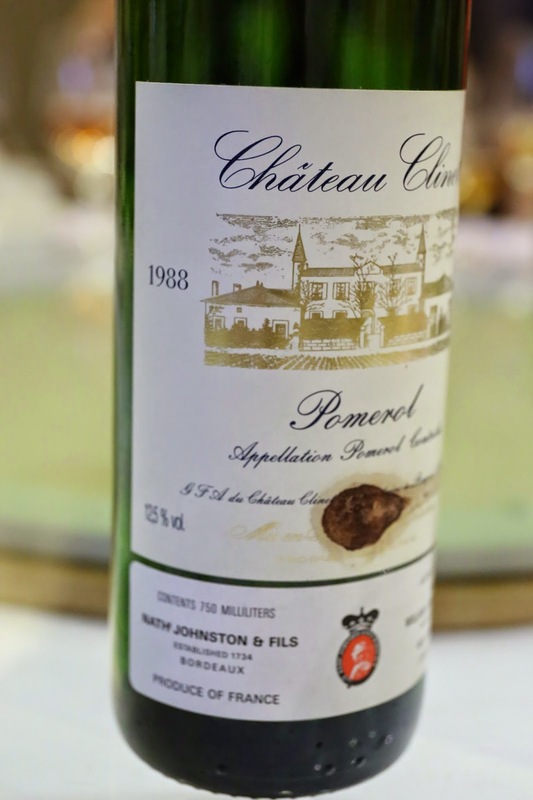 1988 Clinet - a little green and probably un petit bouchonée... with brett. A little bit of stewed fruit here. Still reasonably drinkable. 1980 de Fargues - obvious botrytis and acetone on the nose with apricot notes. Good acidity here. Glad you are also a passionate blogger, because it takes a lot of dedication! Unfortunately this place is introduction-only as it is someone's private entertainment space, hence I have chosen not to publicize the details.